It’s not easy being a teenager. 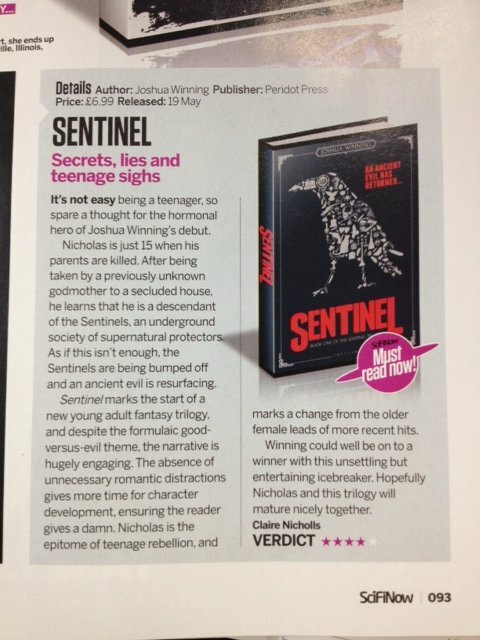 That in mind, spare a thought for the hormonal hero of Joshua Winning’s debut novel, Sentinel. Nicholas is just 15 years old when his parents are killed in a train crash, grieving and confused he is less than thrilled when overbearing neighbour, Tabatha moves in to look after him. Nicholas slowly begins to unearth details of the parents he always considered so normal. For his own safety, he is taken to the obligatory secluded, house in the middle of nowhere to remain under the protection of a godmother he never knew existed. Nicholas learns he is descendant of the Sentinels, an underground society with supernatural tendencies, who strive to protect the oblivious world from dark forces that are out for destruction. As if this isn’t enough for the stroppy adolescent to deal with, he also discovers that Sentinels are being bumped off and an ancient evil is resurfacing. No time for hissy fits, war is on it’s way. Sentinel marks the opening of a new trilogy of young adult fantasy and despite the formulaic good versus evil foundation, the narrative itself is hugely engaging. The absence of unnecessary romantic distractions allows more time for character development and exploration, trapping the reader into actually giving a damn. Nicholas is the epitome of teenage rebellion and his character alone marks a refreshing change from the older, female leads of more recent blockbusters. Visit SciFiNow by clicking here.